Modern advancements have helped to make structural steel fabrication along with other metal processes more precise than ever. From more advanced recycling processes to more efficient cutting improvements, steel has become the top material for building services. One area that can make or break the outcome of your project is steel structure design. It can prove to be very beneficial to find a steel fabrication company that has a long history of precision engineering and expert fabrication and installation. 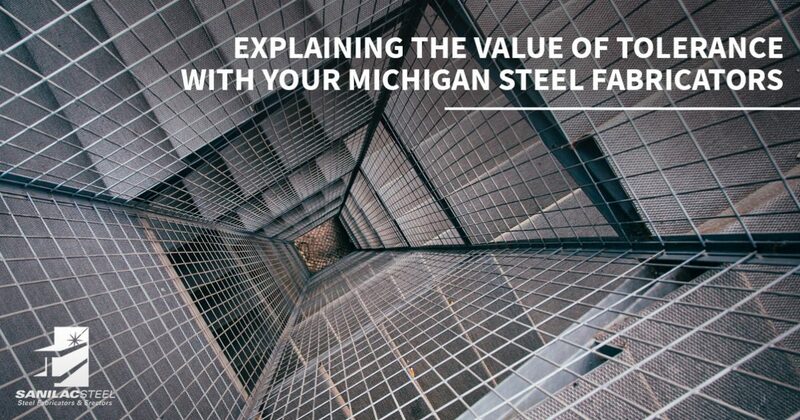 Since 1967, Sanilac Steel has worked to be your trusted team of structural steel fabricators in Michigan, specializing in each phase of the steel construction process to deliver the best results at the best cost. Beyond cost, sustainability, or efficiency, tolerance is the one aspect that truly matters for the use and safety of your product. Tolerance is a measure of the total deviation that is acceptable for design purposes. A steel product can have a design length of 25mm, for example, with a tolerance of .5 mm. This means that your product can deviate half a millimeter, giving you an acceptable range between 24.5 and 25.5. Regardless of the length between these two points, your steel will perform exactly as intended. Anything outside of your tolerance should be deemed unacceptable for use in construction. Why Do We Need Tolerances? Despite our best practices, minor errors can be expected in daily operations. Because of this, structural tolerances are included in all building designs. It’s important to find a steel fabrication company with the experience needed to fine-tune their manufacturing processes to create a product that meets design requirements each and every time. Sanilac Steel utilizes the best equipment in the industry, relying on finely tuned machines and experienced employees to quickly adapt to and match your design requirements. Our fabrication processes are honed to replicate the same results within extremely tight tolerances for a wide range of projects. From ornamental metal work to structural steel for high rises, our team is dedicated to precision to optimize your returns. The most obvious benefit of working with a steel fabrication company that boasts precise results is that your structure will meet its design requirements. This is essential for safe and ethical building practices, as the plans for any project need to be followed to the letter unless approved by an applicable body. The long-term performance of your steel products depends on the design specifications and how closely your product meets those demands. If your parts aren’t within tolerance, you will face a number of problems. Pieces that don’t fit together don’t work, creating costly delays and raising the budgetary demands by requiring more materials. Our manufacturing process works to minimize waste and mistakes, making our services more cost-effective for you. Nobody likes setbacks on the job, which is why Sanilac Steel has focused on building a reputation of quality and precision. If you’re in need of a steel company with a history of optimal outcomes for clients across the state, Sanilac Steel is here to help. For more than 50 years, our structural steel fabricators in Michigan have worked to perfect our processes to produce results within even the most stringent tolerances. Our team will work to get your project completed on budget and on time with the safest and most ethical practices. Contact us today to learn more about our fabrication process or to receive a quote for your project!